This spring I had the pleasure of teaching an evening program at the Museum of the American Revolution in Philadelphia as part of their "Power of the Press" series. The program focused on bringing Philadelphia's print culture of the 1770s out of the museum exhibit cases and into the hands of visitors. The goal of the program was to demonstrate how 18th century printers and consumers used different types of materials to disseminate different kinds of information to different audiences, from an quickly-produced broadside to an expensive book, and compare and contrast those choices to modern modes of media consumption. Working in a museum open to the general public is challenging because it's up to you to bring a potentially dry topic like bibliographic format to life for everyone from children to professional historians, and to grab and keep people’s interests in just a few minutes. A specific challenge of this program was having to explain the layout and printing process in a minimal set-up that could fit in a few boxes in my car, be set up in 20 minutes, and cost a minimum in materials. In the absence of having printing equipment or the time for a more in-depth workshop I developed a program that would focus on a hands-on activity that would let visitors create a single sheet folio and quarto, and a 2-sheet octavo. I also purchased a copy of Rare Book School's "bibliographic format" kits for $35. RBS’s kits are more correctly sized, while I was limited to designing around 8.5x11" printer paper, and the larger format of the pages let me show the folding process to larger groups of people. 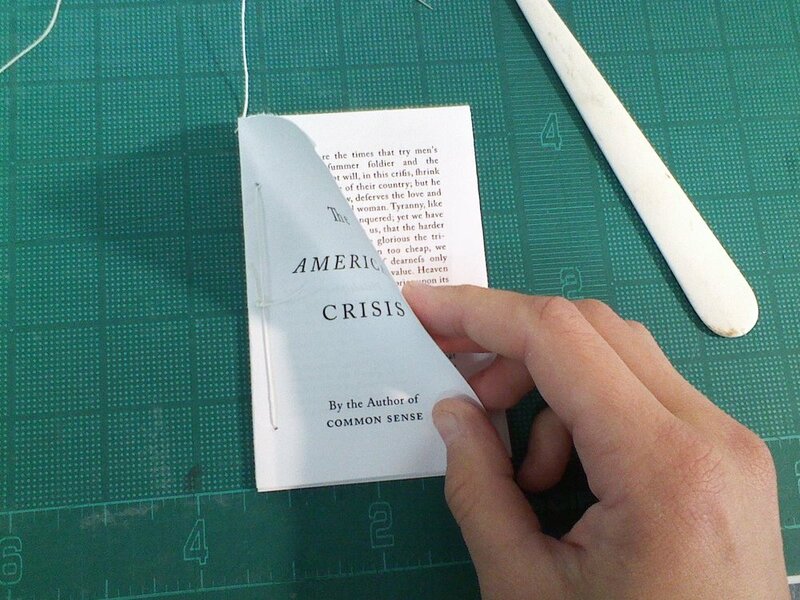 An image of “The American Crisis” before folding. The poem "Tea, Destroyed By Indians,” reset into a single-sheet folio. Esther Reed's essay "The Sentiments of an American Woman," turned into a single-sheet quarto. Thomas Paine's pamphlet “The American Crisis #1,” combined with Phyllis Wheatley's poem "To His Excellency General Washington,” reset into a two-sheet octavo. I created the different pamphlets in Adobe Photoshop CS4 and exported them as PDFs (available in the WBHB dropbox here). While laying out the text in Photoshop was far more tedious to work with than InDesign (1 to 3 hours per text), an old copy of Photoshop is what I happen to have on my home computer. They were printed on laid-look letter paper bought off Amazon. My set-up also included original and reproduction materials, including a reproduction broadside of the Boston copy of the Declaration of Independence done by The Printing Office of Eades and Gill ($17.76), reproduction copies of the Virginia Gazette printed at Colonial Williamsburg for several dollars each, reproduction pamphlets, and several original 18th c. octavos and 12mos, which I purchased for under $30 a volume in various antiquarian bookstore bargain bins. I also had a sewing frame with a book sewn on cords set up, sheets of handmade paper, covering materials such as leather and marbled paper, and print-outs of plates from Diderot's Encyclopedie to show the inside of a printshop and bindery. For the bookbinding stations I had three workstations set up with cutting mats, awls, threaded needles, scissors, bone folders, and paper knives. Visitors who stayed to make all three volumes spent about 20 minutes on average, and a number stayed for nearly an hour to browse my teaching collection and ask follow-up questions about printing, papermaking, and bookbinding. About 40 people stayed to make one or all of the pamphlets over the course of the evening. A top-down image of the table layout. One of my favorite visitors of the evening was the museum’s "superfan" Oliver, who insisted on making all three pamphlets. Learning to fold an octavo sheet for the first time is a challenge for anyone, much less a 7 year old, but Oliver did quite well and walked away with his very own collection of pamphlets.